Look who shows up at the library door . 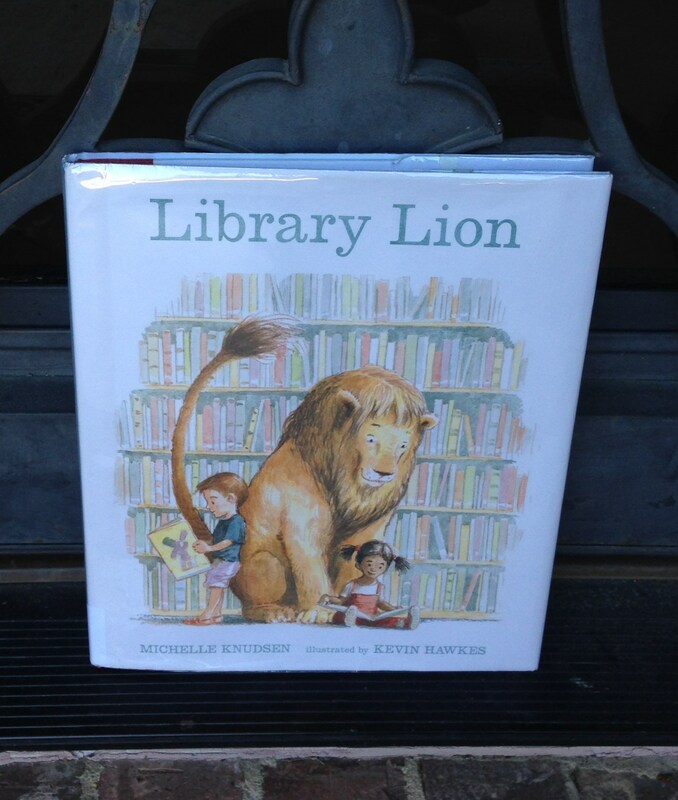 . .
Library Lion by Michelle Knudsen resonates with me because growing up, I saw a library as a place of rules: No running, No talking (loudly), No . . . fun! As a young, active girl, going to our library was like entering an amusement park but not being allowed to ride the rides. Fun was waiting for me, but all I saw was “Don’t pick up a book without putting it back in the right place”. I needed someone to allow me to break the rules a bit– maybe run to my mom excited by my discoveries. Often, I felt as odd as this lion in the library. The twists in this story demonstrate reasons for rules and reasons to let them go and all the while you fall in love with the lion, the library, and the librarians. Michelle Knudsen shows us that libraries are amusing, and anything is possible. Come along for this ride! “Mr. McBee ran down the hall to the head librarian’s office. ‘Miss Merriweather!’ he called. ‘No running,’ said Miss Merriweather, without looking up. ‘Is he breaking any rules?’ asked Miss Merriweather. She was very particular about rule breaking. Thus begins the adventure of a lion learning to obey in the library. Since there weren’t any rules about lions in the library, he could stay, and stay he did. Since he insisted on lingering around until story time, Miss Merriweather put him to work: dusting bookshelves (with his long tail), licking envelopes for overdue notices, giving children a boost to reach books (with his strong back) . He became quite helpful once he learned he could not run or roar. Everyone except Mr. McBee came to love the lion. A bit of jealousy set in when Mr. McBee heard people talking about the lion as though he was the hero of the library. One day while Miss Merriweather was reaching high for a book, she fell and the lion was there to help. This was a time to break the rules! The lion ran to Mr. McBee and when ignored by him, he gave the loudest roar he could muster up in order to get his attention. Mr. McBee set off to find Miss Merriweather to report this incident, but when Mr. McBee saw her lying on the library floor, he realized why the lion had broken the rules. He helped Miss Merriweather, but it was too late to make amends with the lion because he had already left knowing he had broken the rules after he had been warned. In the days to come, Miss Merriweather’s broken arm was healing nicely, but her broken heart was not. She missed her lion. “‘Can I do anything for you before I go, Miss Merriweather? '” asked Mr. McBee before leaving work one evening. She didn’t give him any suggestions, but he knew what he had to do . . .
What rules do you find most difficult to obey? Why do you think those particular rules were made? Is it ever okay to break the rules? Do you think it was okay for the lion to break the rules in this story? Do you think Mr. McBee did the right thing by scolding the lion? Why or why not? What do you think Mr. McBee is going to do next? Share with us some of your dialogue! Sign up for Kidsbook Friends by clicking the Follow button and entering your e-mail address. You won’t want to miss what’s next. This entry was posted in library and tagged librarians, library, lion, rules. Bookmark the permalink.